I have just read the article on the T&A website and I am glad to see that councilor John Cole, has donated some cash to city. This has given me hope that the rest of the council will take note and following his footsteps. I may use this story to back my campaign of raising city some money from the council at my meeting in October. I have managed to find 4 persons, including Allan Carling & Dave Lambert, to go with me on October 16th, all of who are connected, to city. 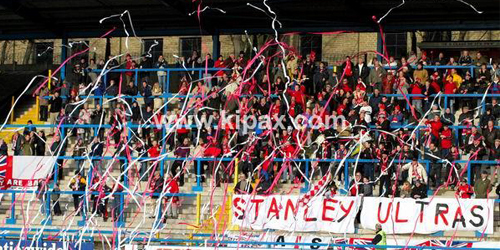 Via the supporters trust, Shipley bantams and others. Now that this has happened I hope it will give my case stronger backing, and it shows that the council can back us. If the outcome is a good one I would like the money to go to Stuart McCall for transfers. I would like to be given a cheque or somthing, i can give McCall personaly. All I can do now though is get my speech ready, and have a meeting with the lads, to discuss the matter, and give it all my efforts, to raise the profile of Bradford City Afc. The waiting game has started so lets sit tight and see waht happens. However I am not going to build myself up too much as I may not get the answer I am hoping for. Thanks again fans and I hope to bring you good news in october, if not then it has not been a waste of time by any means as I am more than happy to help. Thank you for reading this post and the matter is now closed untill further news. Role on october 16th! This is very good news!! !